Two more good middle distance pieces this past week, which are again my best performances over this distances in around 3 seasons. I have always found, over the years I have been training on the erg, that the best way to mentally prepare for any time trial piece is to make a comparison to the last TT piece you’ve done that is comparable and use that to both judge the pace target, and to give confidence. So having done a solid 10k last weekend with a core pace of 1:47 I knew that 1:44s would be fine for the 5k TT. I used that mental confidence to think of nothing else but getting through each 500m split at, or just under, 1:44.0. When it came to the 30min TT then a couple of days later I could then use both the 5k and 10k paces, and pitch the 30mins in between. Each of these TT rows had a good strong finish, showing there is more potential in there, but also good solid base paces that I held well. Some people of course will question “if you have so much left at the end, surely you could go quicker earlier in the row?”. Physically, perhaps. Mentally, not yet no. A fast finish is always there, for me at least, on a middle distance TT no matter the intensity of the rest of the row. My past weeks training is below in reverse order. In case you’re wondering why on the harder efforts I have set odd looking split lengths for the 30min and 10k efforts, the simple reason is to split each row into 8 equal length splits. Why 8? Because that is the most you can display on the screen at once when you look back at your session, and I record the sessions by taking a photo of the screen with my mobile phone. So because of this I have been using 1250m splits for 10k rows, and 3min45 splits for 30min rows. For easier 30min efforts I stick to my usual 5min split lengths, and don’t record them here anyway. It has been a hot couple of days here, so this was a sweaty effort, and feeling somewhat fatigued from yesterdays 10k. On this type of effort I feel nice and comfortable at the start, then it starts to feel tough around half way and I wonder if I can keep up the negative splits. But when I approach the final split and have a round number target in mind there is never any trouble increasing the pace quite markedly to achieve it. So here I saw 8400m as a nice target and simply aimed for that in the final split. Late in the day, really hot and humid. 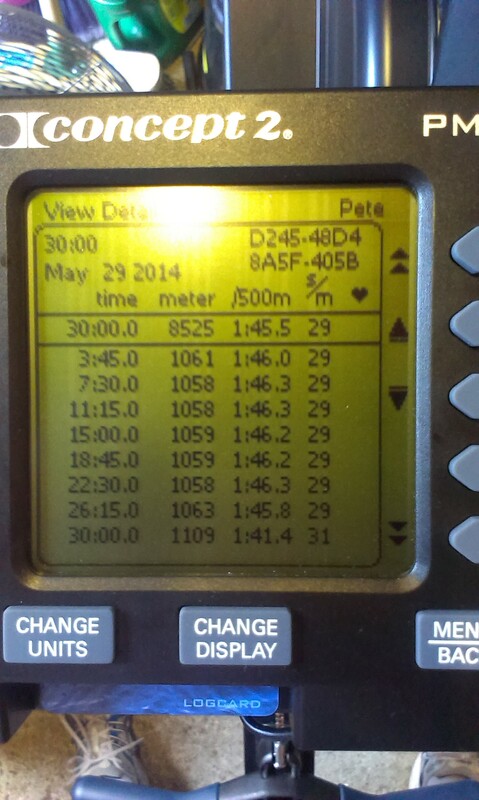 I had a target of sub 36mins going into the row, but really wanted to be pushing closer to 35:30 in reality. After a fast start I dropped to cruise pace, but had to readjust the cruise pace and just do enough to keep myself within reach of the sub36 target. I had spent 3 hours out in the sun, up a ladder, trimming the trees in my back garden. I was tired and sweaty before I started, but figured I may as well row. Target was a sub 36 for 10k, but it wasn’t going to happen. This was the reason I redid the same row the following day. A long meeting up north followed by a 4hour drive back home in the evening yesterday, so this was a much needed rest day. Away staying in a hotel due to a work meeting. This was a 6:30am session on the one erg in the hotel gym. Really not like me to miss out on sleep and train straight out of bed, but it meant I didn’t need to train in the evening, and could take the following day as a rest day if I wanted to. Which it turned out I did want to! As well as getting straight out of bed and into the gym the following morning, the first thing I did after checking into the hotel was to head to the gym and do a steady 30mins on the erg. Although I’m not doing any truly hard sessions at the moment, I have got into a good consistent training routine, and training has become habit. It is therefore not hard to get the motivation to do something every day when I have the opportunity. This was just slightly slower than the best 30mins I have done for some time (only by 0.2sec), so a good positive effort. At some point soon when I feel good I will warm up properly and do a proper hard attempt at either the 30mins or 10k and push one of them under 1:46.0. My ultimate target for this year is still to put in a sub 35min (1:45.0 split) 10k. I am confident I can achieve this. So overall 8 days where I trained 7 times with only one rest day, another good week overall. Not much variety, mainly fairly hard 30min or 10k rows, but all good fitness work. By back to the grind as the title of this blog entry I am referring to the grind of post graduate university work. Tomorrow is the first day of term for the last taught class of my masters degree. So about 10weeks of hard work to get this last class out of the way and I’m nearly there. Unfortunately this means that all of my free time is gone for this period. It’s been a nice break having not had a class since Christmas, but now it is time to get back to it…..
After yesterday’s hard 10k ideally today should have been a nice steady (lower intensity) distance piece, but in general I get bored more easily on lower intensity rows, and as my overall volume of training is pretty low I can listen to my body and rest when I need to. 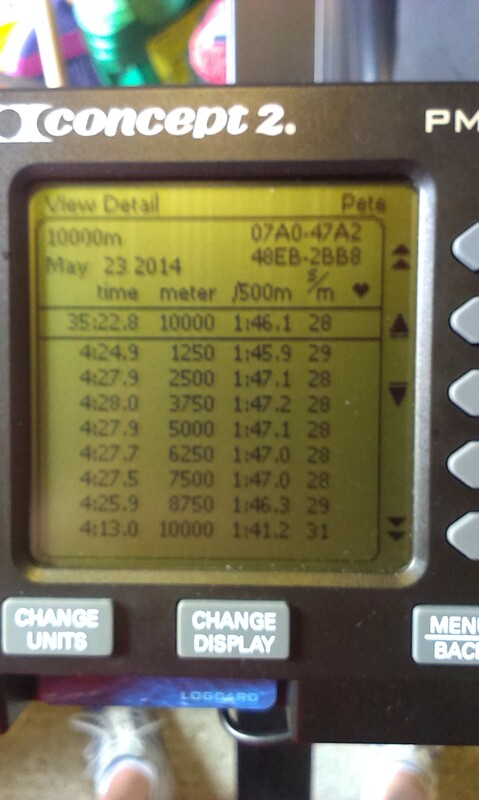 A 1k warm up prior to the 10k to allow a quick start, then settled into maintain sub 1:48 splits throughout the row. Still able to put in a good fast last 1250m, which to me shows that I am working harder mentally through the middle of these 10ks than I am physically. No warm up for this one, or rather I incorporated the warm up into the first section of the 10k. 1:50 pace is about my cut off for not needing to warm up before. As long as the rate is fairly high I don’t stress my body too much at that pace and rate combination. Felt good throughout this one, and enjoyed pushing the last 1250m hard. 500m splits all 1:44.8 or 1:44.9 aside from the last 500m at 1:41.8. Time constraints meant this one had to be done about 30mins after dinner, but it needed to be done as redemption for stopping at half way on the 5k the day before. 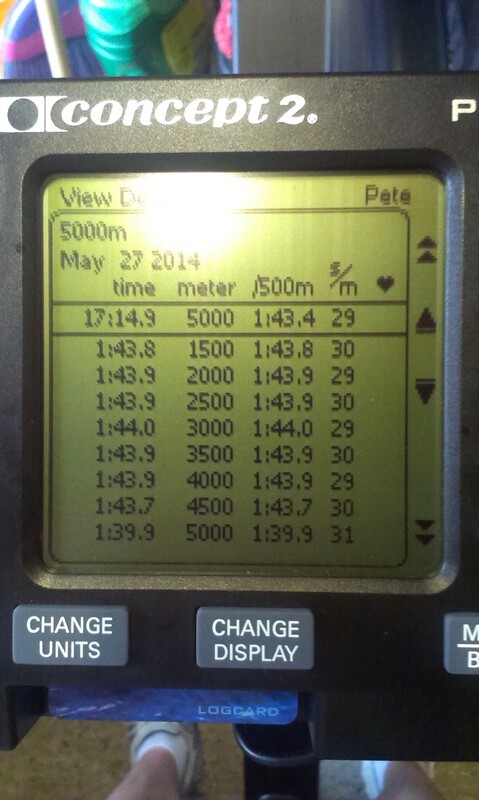 2500m @ 1:44.9 as an aborted 5k attempt, followed by 500m @ 1:26.1. DOMS from weights on Monday made the 5k heavy from the start, and caused me to struggle to get the rate up to where it needed to be for the pace. Rather than slow down (which I should have done) I got through to half way then stopped. An early 500m challenge series row for the month just to put a marker in the sand. Training back in the killer instinct sprint finish here. Deliberately slightly lower intensity for the first 8750m than I can do to set up for a fast last split, and pushing that last split hard to see if I could get the row under 36mins. A good solid 60min row. Steady and comfortable at 1:52.5 for the first half, then gradual negative splits from there before pushing hard for the final split.